Lifetime Basketball Hoop - 90013 60 inch Glass Backboard System. 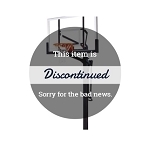 Price includes shipping for the Lifetime Basketball Goal when shipped to the contiguous 48 United States. The 90013 Lifetime basketball goal brings a 60 inch glass backboard system to your home for cheaper than ever before. This goal provides you a tempered glass backboard, measuring 6 mm thick. The frame on the backboard is steel, providing optimal support and rebound for the backboard. The system also uses 4x4 inch steel square pole. Square poles have less movement in the ground than round poles. The 90013 is also height adjustable from 7.5 Ft. to 10 Ft. in infinite increments using Lifetime's pneumatic lift mechanism, the Power Lift. Simply squeeze the triggers behind the pole and raise and lower the rim height with ease. 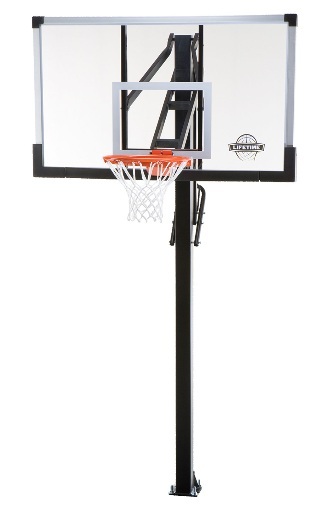 Backboard Dimensions: 60 inches W x 36 inches H.
Comes with the Slam-it Ultra Breakaway Rim. Rim uses 5/8 inch steel with wrap-around bracing. Backboard to Pole Clearance: 27 inches offset. 1.5 inch steel frame surrounds and supports the backboard. 4x4 inch steel square pole. Pole pad included to help protect players while playing basketball. Pole uses anchor kit to attach to the ground. Anchor included with purchase. Anchor kit is a J-Bolt anchor plate. Rim is height adjustable from 7.5 Ft. to 10 Ft. in infinite increments using the Power Lift. Power Lift uses a squeeze handle placed behind the basketball pole; simply squeeze the triggers together, and raise and lower the rim with ease. Product Packaging weight: 215 lbs. Package ships via an LTL freight carrier. Delivery is a curbside delivery, meaning the customer must be available to both sign for the package and take the package off the truck. Lift gate and in-home deliveries are also available for additional fees. If you need either or both of these services, please contact Competitive Edge Products by phone or email to get a quote. Anchor kit used on this basketball system is different from the anchor kit used for the Mammoth Basketball Goals. This basketball system uses an anchor kit to mount the pole to the ground. The anchor kit consists of 4 major parts: a flat square steel plate and 4 J-Bolts. The J-bolts are what they sound like, a long bolt in the shape of the letter "J". The plate part of the kit will ultimately be above ground while the J-bolts are going to be cemented into the ground. While requirements for installation of the 90013 Lifetime basketball goal might vary from location to location, the installation instructions state the hole for the anchor kit needs to be 21 inches x 21 inches and 30 inches deep. This goal looks to be solid. Takes more time than you think to put together. Start to finish it was painless just took time. Plan on more than 7-8 bags of concrete. Time will only tell if what I bought was worth it! Very good hoop. Took my time to put it together and you may need at least 3 people to lift it on the screws, but it is worth it. Real glass backboard, real good. GREAT goal! Terrific backboard action! Love that I can adjust the goal so easily when I play with the kids so that they can all play and then put it back up for the big kids. Take your time putting this thing together. If you have access to a auger use it. I did not have one and I ended up using a railroad pole which did work but that took several hours. It took 10 80 lb. bags of Quickrete. Use a helper and mix it as fast as possible. Check the threads BEFORE you put the goal in place. I did not and fortunately I had a friend who had a tap set to re thread the bolts. Take your TIME. Overall, A GREAT goal for an incredible price. Looks great plays wonderful. Kids love it!